Background: A simple and eco-friendly synthetic protocol for synthesizing naphtho[ e]bis[1,3]oxazines in good yields has been developed by using one-pot three-component Mannich-type condensation cyclization reaction of various dihydroxynaphthalenes with primary amines and formaldehyde in water at 80-90°C. Methods: The chemical structures of synthesized monomers were confirmed by IR, 1H-NMR, mass and elemental analysis. Result: Some of these compounds exhibited promising processing window for polymerization according to their differential scanning calorimetric analysis. Keywords: Eco-friendly method, Mannich-type reaction, naphtho[e]bis[1, 3]oxazines, one-pot synthesis, polynaphthoxazines, water. Keywords:Eco-friendly method, Mannich-type reaction, naphtho[e]bis[1, 3]oxazines, one-pot synthesis, polynaphthoxazines, water. 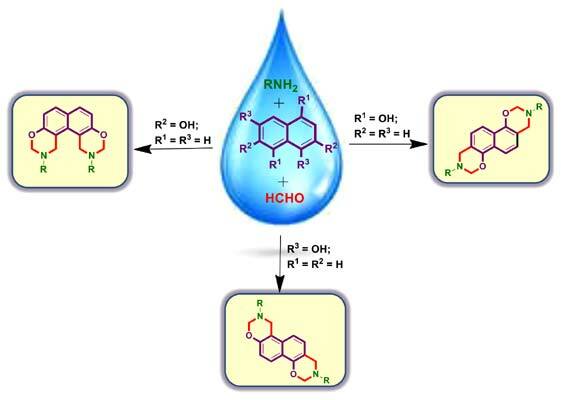 Abstract:Background: A simple and eco-friendly synthetic protocol for synthesizing naphtho[ e]bis[1,3]oxazines in good yields has been developed by using one-pot three-component Mannich-type condensation cyclization reaction of various dihydroxynaphthalenes with primary amines and formaldehyde in water at 80-90°C.